Never miss a thing by following us on Facebook! It’s the quickest way to find out about changes to games, training, special events, highlights and news on your favourite Football Club. The FFA has updated their online registration system, now called Play Football. You will notice that is looks a bit different to the old system, but your information should have been transferred across, so it should be quick and easy to register. Please see our Regstration Page for details. If you just want to leap right in, here are the direct links for online registration with Epping Eastwood Football Club. 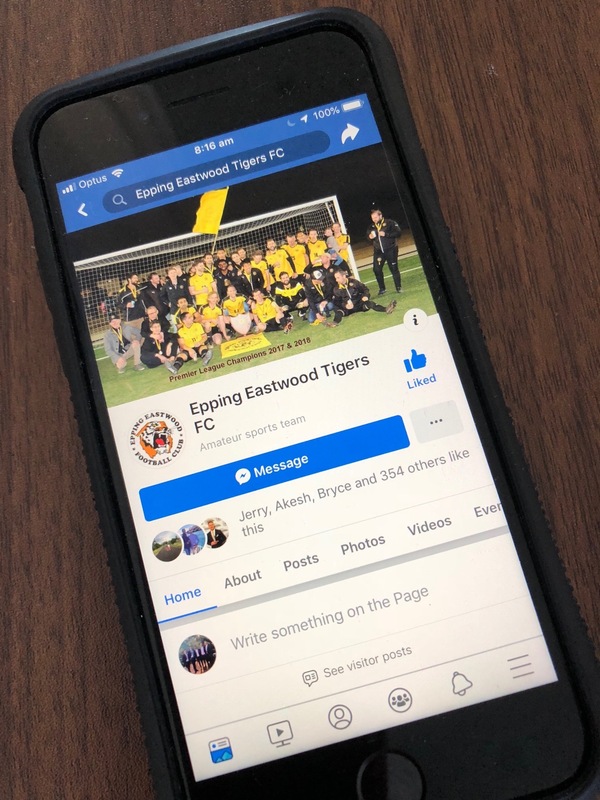 The Epping Eastwood Tigers’ Premier League team has taken out the title of GHFA Premier League Champions for the second year in a row. Tigers Premier League Manager Andrew McLaren said the grand final game against Eastwood St Andrews was an extraordinary demonstration of the Tigers renowned quality of never giving up, even when the team were sitting on 3-0 with just 10 minutes to go in the game. “This game was extraordinary and possibly one of the best games of football you’ll ever see,” Andrew said. “I am so incredibly proud of this team and the Tigers as a Club. They never give up and that’s what this Club and this game teaches you. “It was looking all but over when St Andrews scored for a third time but the Epping Eastwood coach recognised Tigers needed to score and do it quickly so he changed the formation, and with only 7 minutes remaining in the game, Epping Eastwood finally broke through with a clever little header from replacement mid fielder Eddie Lun. “Then minutes later a beautifully placed glancing header from Tom Kay rippled the top left corner of the net. And the Tigers were back in the game!! “The final breakthrough happened with less than a minute of regular time to play. “A free kick was awarded to the Tigers on the right hand flank outside of the box. Every Epping Eastwood player was in the box ready to pounce, including our goal keeper, who left his goal for this last ditch attempt to level the scores. “Geoff Turner was given the responsibility to deliver a ball across the face of the goal for someone to head home. The cross was superb and whipped past everyone in front of goal to the far post where the Tiger’s keeper Daniel Buttrey was lurking unmarked. His finish was impeccable and the back of the net was ruffled for a third time. Neither Club could break the score during the extremely tense 20 minutes of extra time and the game went to a penalty shoot-out. The game was now left to be decided by penalties. Both sides missed one shot each in the early rounds with the final breakthrough happening on the 3rd penalty for the Woodies. “Tiger’s hero goalie Daniel Buttrey saved one for the Tigers and with the score now 3 to 2 in favour of the Tigers they only needed to score their fourth to be victorious,” Andrew said. “St Andrews were great competitors and played a great game but the Tiger’s attitude won this game for sure. “Tigers have worked hard all year for this outcome and they really deserved this result,” he said.